Storing your flammable materials doesn’t have to be a hassle. Compliant flammables storage should increase protection to your personnel as well as the chemicals within. 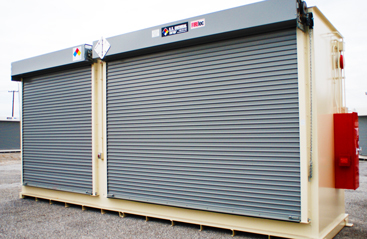 Flammables storage from U.S. Chemical Storage is designed to prevent external fires from interacting with the flammable materials within, as well as containing any fires that may occur because of chemical reactions within your flammables storage building. With 2-hour and 4-hour fire rated options, your buildings will give emergency personnel the opportunity to extinguish external fires while protecting your chemical inventory. While containing any fires that may occur within, your flammables storage building should be equipped with fire suppression systems that will trigger the moment a fire leaps into existence, preventing the spreading of flames and effectively extinguishing your flammable materials. At U.S. Chemical Storage, we make it out goal to provide you with the safest, highest-grade flammables storage facility in the industry. Our containment sumps are designed and tested to prevent even the smallest leak from escaping your flammables storage building. Our buildings are built by experienced engineers and certified welders for superior construction, securing your flammables storage and protecting your personnel with the highest safety standards and our industry-leading structural warranty. Our flammables storage buildings are 100% customizable, so the final product will be built to your exact specifications. From the type of door, to the proper accessories, and even the size if your containment sump, it’s all customizable. Our buildings are built to help you achieve chemical storage compliance while protecting you from potentially dangerous incidents. Whatever flammable materials you plan to store, gaining compliance is simple and efficient with U.S. Chemical Storage. Our products are pre-approved by Warnock Hersey or FM Global, removing several time-consuming steps from your flammables storage process. Let us help you achieve compliance and set the standard for the safest flammables storage facility in the industry.